Father’s Day: Let the Games Begin! Raise a glass (literally!) to the special man in your life this Father’s day with some family fun here at the brewery! Past Father’s Days have been so popular here, we decided to do things a bit differently this time to ensure that the special dad in your life has plenty of fun, food, and refreshment here at Throwback Brewery. So, we’re dividing the revelry into two sessions: Sunday, June 17th from 12-3pm and the next session from 4-7pm. There will be a special menu that day with some of our most popular food items, plus plenty of specials. And, for the first time ever, we will be holding The Father’s Day Games – just for Dads. The only way in is with a ticket and a limited number will be sold – so treat dad and grab yours today before we sell out! Everyone will need a ticket that day to get in. Tickets are $10 each, and the entire amount will be deducted from your bill when you come in on Father’s Day. Tickets are to make sure we don’t go over capacity, and to ensure that you guys each have a guaranteed seat! As such, each person attending will need their own ticket to get in. Come on by any time during your session, but make sure you leave yourself enough time to play before it ends! Price to play is $12. This includes a stylish, traditional German-style dimpled half liter glass stein with a Throwback Logo on it, of course! (retail cost is $12), plus a free fill of your choice of our Hog Happy Hef, Oma’s Tribute, Hank’s Pale Ale, or Love Me Long Time Pilsener to fill the stein (retail cost $6.50++). So, 18.50+ of value, and you also get to play in the game (priceless!). The ten remaining competitors will then move to the ping pong table, where a variation of beer pong will occur. Toss a ping pong ball towards a pyramid of cups (either throwing it with your hand, or using a paddle). Each player gets six throws. 2 points for sinking a ball into a cup, and one point for hitting the ball off the cups. The top 4 point getters will move on to Round 3. In Round 3, the remaining beer-savvy contestants will take on our version of flip cup. Each player will face the ping pong table, where there will be three (compostable!) plastic cups open side up at the edge of the table. Each player will attempt to flip each of their cups – by flicking or lifting the bottom of the cup – until it flips and lands face down on the table. First two players to successfully flip all three cups using only one hand will move on to the finale. The final two dads will face off for a short round of beer trivia. The winner will take home the Baron of Beer Belt, bragging rights, and a Throwback Brewery sweatshirt. Chef Carrie and team always have something delectable ready to serve up for those dads, and this year is sure to be better than ever! Look forward to a special menu just for the day including goodies such as a ‘Father’s Day Sundae’ showcasing a Candied Rhubarb Pork Belly atop Lagos French Vanilla Ice Cream (!!) as well as staples like our Throwback Burger, Korean Wings, and more. 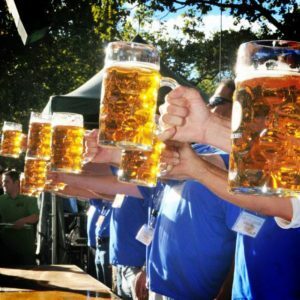 For session tickets and to reserve your beer stein for the games, click here. Hope to see you here!